Mobile presentations with fast set up, with presentations loaded on-board into 7GB of internal memory to eliminate computers or other source devices. Physical attributes. The connector panel is on the rear of the M318WL. Air intake is from the front right side, and hot air is exhausted from the left and rear right side of the chassis. The power connector is at the lower right of the connector panel, and a keypad is located at the back center of the cover panel. ECO mode. ECO mode reduced brightness by about 15%, so using Eco mode reduces fan noise and has little impact on image brightness. Brightness Uniformity. 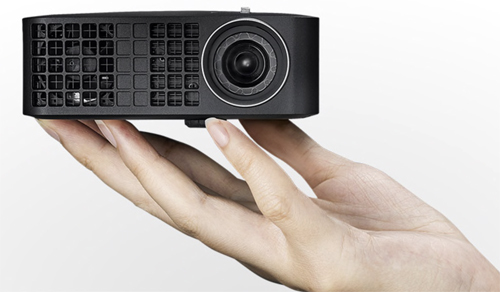 The M318WL showed uniformity of 85%, which is excellent for such a low-cost projector. Even on solid color screens, it was impossible to detect any bright spots. Throw Distance. According to its specifications, the M318WL can put up focused diagonal images from 30" to 80" from throw distances of 3.2' to 8.5', respectively. However, our test unit focused well at up to 25% longer and shorter throw distances than specified. Actually, it was still in focus with image sizes in excess of 100", but the image was too dim to be useful. Input Lag. The M318WL has an input lag of 17ms. Fan Noise. Fan noise is quite low and is composed of medium frequencies that will not bother most viewers. Eco mode substantially reduces fan noise with virtually no reduction in image brightness, so for intimate gatherings, Eco mode is a good choice. Mounting. Since the M318WL is so small and light, care must be taken when routing cables to the projector. Any tension in the cables is liable to twist the M318WL off-axis. To minimize this issue, a small collapsible tripod is supplied. It simply screws into the base of the M318WL and has a locking mechanism that minimizes and torque from cables. Be aware that the M318WL cannot be tilted back to project on the ceiling. Throw distance. The M318WL is rated to display diagonal image sizes of 30" to 80". Since there is no zoom lens, the image size is varied by moving the projector closer to or farther from the screen. For a 30" image, the projector is about 3'2" from the screen, and for an 80" image, it's about 8'6" away. Focus. Focus is smooth and effective beyond the rated throw distance range, so image sizes below 30" and above 80" are possible. Our test unit maxed out at about a 100" diagonal and the image was a bit dim, but in a darkened room, it was quite acceptable. The Dell M318WL is an outstanding little pocket sized presentation gem that is quick and easy to set up for small group presentations where you don't need the huge screen size you get from bigger and brighter projectors. It delivers solid contrast and a sharp image edge to edge. Data projection looks clean and crisp even at small fonts with maximum keystone correction. We tested the M318WL in different lighting conditions from full normal room light, to subdued, dim lighting to dark. In full room light we got a very satisfactory data presentation image at 50" diagonal; in low ambient light you can go to 70", and in the dark it can go to 100" diagonal. So there is more than ample image size for small presentations, with extra latitude to go to 100" and a larger audience in the dark if needed. The M318WL connects directly via HDMI cable to sources like laptops and DVD players, and memory sticks plug directly into the USB connector on the rear panel for presenting Microsoft Office files, photos, and music content. You can also transfer files to the M318WL's internal 7GB memory for wire-free presenting. For wireless devices, you simply purchase the optional wireless dongle (Dell 725-BBEY) and connect to tablets, phones, and other wireless devices. Though designed for mobile presentation, the M318WL can double as a solid video projector as well, although you'll want an external sound bar for the full experience -- the 1W on-board speaker is not intended to give you the sound a big video picture demands. But assuming you've got the sound covered, the M318WL produces very satisfying black levels and color saturation is good. Color is reasonably well balanced and very watchable in Presentation mode in particular. With a street price of about $400 and an LED illumination system with a 20,000-hour life, cost of ownership is negligible at about $0.02 per hour. The illumination system is warranted for the same 2-year period as the projector itself. The M318WL does not come with a remote control, as the projector itself is not much bigger than the remotes on larger projectors. So you operate its menu from the control keys on top of the projector. However, if you want a separate remote you can get one as an option (Dell 725-BBEP). That gives you a couple of extra benefits -- first it eliminates image shake that can happen if you're using the buttons on the projector itself, and second, it gives you single-key control functions not available on the built-in keypad such as source switching, audio muting, and presentation mode. Another optional accessory is a battery pack (Dell 451-BBKV) that will give you about two hours of data and video presentation on a charge. It's a handy feature for those times when you are not sure that an AC outlet is available at your presentation site. There are few projectors that combine 500 lumens and a sub-$500 price in a package as small and portable as the M318WL. With an internal memory of 7GB, you can load your presentations into the projector and operate without any source devices. This puts it in a class by itself. Our lab tests show that the Dell M318WL meets or exceeds its specifications, so for extremely light, portable, quick and easy presentation use it is an outstanding value.